Dr. Jaglan and her staff were exceptionally proficient and professional. This was my first eye exam in approximately 10years and they guided me through everything with patience. Everything was explained in simple and relatable terms, which is always nice. I found her office through Zocdoc via a Google search; they had great reviews, so it's only fair to share my experience. Dr. Jaglan and her staff were exceptionally proficient and professional. This was my first eye exam in approximately 10 years and they guided me through everything with patience.Everything was explained in simple and relatable terms, which is always nice. I found her office through Zocdoc via a Google search; they had great reviews, so it's only fair to share my experience. The entire staff was courteous, kind, professional, and punctual. They explained my examination, results, and insurancecoverage in great detail. They assisted me in picking a pair of glasses that I would want to wear versus have to wear. I will return for my next exam. The entire staff was courteous, kind, professional, and punctual. They explained my examination, results, and insurance coverage in great detail. They assisted me in picking a pairof glasses that I would want to wear versus have to wear. I will return for my next exam. 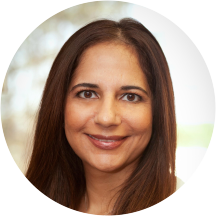 Dr. Parveen Jaglan, a board-certified optometrist, attended Ferris State University in Michigan for three years for Applied Biology before accepting an early admission to New England College of Optometry, Boston, Ma. She was one of the very few that received admission in any optometry program after only three years of undergraduate studies. Dr. Jaglan graduated with her Doctor of Optometry in 1996. She was a recipient of the Ramsey Clarence Scholarship to attend New England College of Optometry. Dr. Jaglan has worked in numerous settings for eight years before settling in Smyrna, Ga in 2004. She gained vast experience in all primary vision care from Albany, NY, to inner city Philadelphia, PA, to working with private practice catering to the Brazilian population in Boston, Ma. During those years, Dr. Jaglan was exposed to many pathological eye conditions that she treated and co-managed with ophthalmologist. Dr. Jaglan purchased the established 20 year old practice, Eye Associates of Smyrna, in 2004 and then expanded the success of her practice to her second location, Eye Associates of Locust Grove, in 2006. Dr. Jaglan comes from a family of eye care providers. Her husband is a Harvard trained Retinal Ophthalmologist working in his own private group practice. Her brother-in-law is also an optometrist and her father-in-law works for non-profit mission eye hospitals all over East Africa. Dr. Jaglan is a proud mother of two daughters. In her very little spare time she enjoys playing tennis on ALTA and USTA leagues. Excellent, on time and very knowledgeable! Have been going to her for years & frequently recommend her. She is always up to date with the latest knowledge and very accommodating. Even after arriving 15 mins late due to good ol' ATL traffic, I was greeted with smiles and friendly personalities, which was so welcome! I would advise filling out the intake form beforehand because I was then taken right away. 0wait time! The technology there is up to date - no need to worry about puffs of air being blasted in your eye. Once Dr. Raglan came in, she immediately was able to diagnose my problem and clearly explain to me the steps to correct it. I never felt as if she was rushing through my apt. In fact, she even had her staff take more photos of my eyes after learning of a past surgery I had. Overall, I would definitely recommend Dr. Raglan and her staff. Dr. Jaglan is a fantastic ophthalmologist - she truly takes the time to ensure she answers all her patients' questions and her staff is well trained and has access to the latest technology to make eye exams less painful and quicker,while still preserving a high standard of care. Well managed office, friendly staff. Would definitely recommend! It was awesome. The best eye exam and overall health related experience I've ever had. Clean office with friendly and professional staff. I was in and out within a small amount of time and Dr. Jaglan was helpful in giving me advice on optical hygiene. Got me set up with new contacts quickly and cost effectively! They do not overbook which makes the waiting time perfect. I like that it is small and not a huge staff, makes it more personable and comfortable setting. Dr. Parveen was very patient, professional, and great at her job. What a great experience! Front office staff we're very cordial and attentive. The doctor was excellent and most definitely relieved me of the stress I was having about the appointment. I highly recommend her! The staff was extremely nice and polite. The dr was very friendly. Dr. Jaglan was wonderful, very professional and knowledgeable. I appreciate that she thinks more holistically in her view and perspectives of overall eye health. Dr. Jaglan is very personable and has done an excellent job over the years that she has been my optometrist. She has state of the art equipment (no more of the puffer machine for annual check ups, alternative ways to checkeyes without dilation, etc). I continue to be very satisfied with her and her staff. I would highly recommend her to anyone looking for a great optometrist.. This was my first visit to Dr. Jaglan office. It was a pleasure to meet her. She was thorough and very professional. She answered all my questions. She made me feel very comfortable. This was for an annual eye check up.Also, the front desk staff was very nice. They were very pleasant. I would definitely recommend going to this eye doctor. Dr Jaglan is the best eye doctor I’ve ever seen. I never leave reviews like this but she is incredibly knowledgeable and has fantastic advice. The whole staff is courteous and friendly and fun. I’ve been going here for 6 years - fantastic!! I've been seeing her for years. Always professional, and performs all services required keeping up with current technology. No issues or problems with her or her staff. This was my first visit and I am very happy with my entire experience! Dr. Jaglan is always extremely timely and gives me the most accurate prescription. Her office staff is very friendly and kind. She is kind and it is sad that she no longer takes our medical coverage because she will be missed. Dr. Was friendly enough. Maybe she was in a rush but considering I was a new patient, I expected a more friendly atmosphere. Also, little was asked about my previous health information. All in all, the services I needed (a simpleeye exam check up) was given. So overal it was a satisfactory visit. She's awesome and her office people are super super nice and fun to be around ! Kindest Eye care in all of Atlanta ! She's great! I've been patient for several years now. Dr. Jaglan is excellent! I would recommend her to everyone. The office staff was friendly and professional, even first thing in the morning, and even though my appointment was unexpected because it was made through ZocDoc. Dr. Jaglan was very thorough and took the time to explain what she was seeing(and what I wasn't seeing and why). Overall, a great experience. Dr. Jaglan was very knowledgeable and thorough. She took the time to explain exactly what was going on with my (and my children's) eyes and the reasons for her recommendations. I totally trust her with my family's eyes! I enjoyed my visit. Dr Jaglan was friendly, very knowledgeable and approachable. The exam went very smoothly. Her staff is also most friendly, and did an excellent job of helping me choose new glasses. I most definitely would recommend her to new clients. Dr Jaglan has terrible bedside manners. She is not personable at all, never smiles, and gets irritated with patients easily. She is also rude and takes no pride in her business. During my first appointment with this practice, I was thefirst appointment of the day and she hadn't arrived yet when I got there. The front desk associate was there to greet me and was very friendly. Dr Jaglan arrived a few minutes after me, and she seemed cold and angry because she walked in right past me and said nothing. She put her things down behind the counter, conversed with the front desk associate a little, and then walked over to a shelf right next to me to look at frames (not sure why, I'm assuming for another patient) . She never said a word to me at all. If I were her, I would have at least said "good morning, I'll be right with you" to my patient. It didn't help that a giant roach crawled across the floor right in front of me while I waited to be called back. Obviously this isn't a place that I would be eating or anything like that, so I wasn't going to leave but I was still grossed out. They did eventually get to calling me back and my exam was quick and thorough, but she got irritated with me easily when telling me where to turn my head etc. She was very knowledgeable about what my insurance paid for and gave me great options. I still left with a pretty bad taste in my mouth, but I let it go. When I came back for my follow up, I had just arrived and was waiting patiently at the counter to be greeted. No one was there. Then, she appeared and walked up to the counter. She saw me, grabbed some paperwork, and then disappeared into the back of the office without saying a word. This wasn't the first time she had done this and so I am now positive that she is just rude. Her staff is nice though, and thankfully someone eventually came from the back and greeted me, taking care of the reason for my visit. Despite that, I won't be back next year! Great visit and Doctor. Very personable and got me to 20/10. My partner and I were visiting from NYC and (per my Aunt who is already a patient of Doctor Jaglan's) we both set up eye exams. Doctor Jaglan was very thorough and has a great bedside manner. Her staff was verykind and helpful as well. Would definitely recommend Doctor Jaglan to anyone in need of an eye exam. She is an excellent Doctor! I've been a patient for about eight years and am very pleased! Had an appointment and was in and out it went great. I would like earlier appointment times. The examination was thorough and thoughtfully done. The doctor considered my needs and was kind and patient. All the office staff were pleasant and provided excellent customer service. It was a very nice experience - the entire office was very friendly and helpful. I highly recommend!